Give me a chance and become my Patron! Patreon is a crowdfunding platform. “And what’s that?”, you ask. Well, a crowdfunding platform is a way for artists to get sponsored by kind contributors in exchange of rewards. For example, imagine that you are fan of a writer and this writer puts a new chapter of its best book every month for free in his Patreon’s site. You can donate him a certain amount so he can offer you a digital copy of it’s book or the chance to read the chapters before anyone else, or a priviledge that no-Patrons haven’t got. That’s how it works. People makes donations and artists (musicians, comic artists, crafters, etc.) gave them rewards as prizes for their kindness. And so do I! What’s different from Kickstarter (another crowdfunding platform)? There are some differences, but the most important is the way you sponsor an artist. In Kickstarter, artists set goals and they get the money only for those goals. When they’re finished, it’s over. For Patreon, the contributions (or pledges) are monthly. Wait! Don’t jump to conclusions! “Monthly” means that you make contributions of a certain amount every month so you can have access to special updates, in addition of the completely-free comic pages, but you can stop the automatic payment at any time. For example, if you decide to pay 5$ per month to an artist, that’s what you’ll pay the next month. But if you only want to pay once, you can cut the payment for next month without problem. However, the updates you get because of your contribution won’t be available anymore unless you decide to donate again. Keep in mind that Comic pages will be free here in my webpage and on Patreon, but if you want to get some goodies, the minimum donation is 1$. 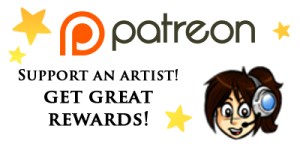 You can find more informationn and the list of rewards and amounts in my Patreon’s page.